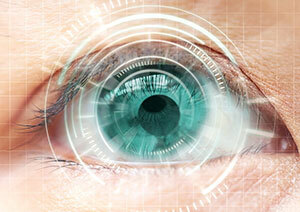 My eyes seem to strain, one eye blurry after LASIK: Treat the eye with “clear” vision!! Yesterday I examined two patients with this same complaint. One was from another practice who came for second opinion, the other was in for a LASIK enhancement. Both patients measured 20/20 vision in both eyes. The right, blurry eye measured a mild “near-sighted, or “myopic” prescription, the other eye with the “perfect” vision had a mild far-sighted, hyperopic prescription. What you need to understand about hyperopia is that if the prescriptive error is mild the distance vision in that eye will be excellent. In hyperopia, the natural focal plane is actually behind the retina, and this would cause a blurred image. But the blur image will cause the brain’s focusing reflex to send an accommodative impulse to the ciliary muscle, which pulls on the eye’s lens causing it to refocus and clear up the image. It does this by pulling the focal plane forward to the foveal part of the retina (the small area responsible for the sharpest acuity). The problem is, both eyes work together, so the focal plane of the opposite eye is also pulled forward in unison with the hyperopic eye. The lenses of the two eyes cannot work independently! So now the “perfectly” focused eye (emmetropic) itself becomes the blurred eye, because its focal plane is in front of the retina causing a mild myopia! Now the question is what to do? The “blurry” eye as perceived by the patient actually has a perfect focus (emmetropia). To prove the imbalance, we must allow the other, hyperopic eye to relax its accommodated lens either by dilating eyedrops or by careful examination with lenses. So the answer is to treat the hyperopic, “clear” eye with a LASIK or CK enhancement. This will resolve the hyperopic condition and restore balance, allowing both eyes to relax, reduce the eyestrain, and improve vision in both eyes!